One of the odd troubles we face in Southern California when it comes to home heating is that it’s easy to let a heater stay around for far too long in a house. When people don’t rely too often on a system like a gas furnace, they often don’t consider when it’s old enough that it needs to be replaced. It’s true that heating systems don’t wear down as fast in our warm climate because they do less work. But age still affects them, and it’s important to know when it’s best to have an older heater replaced. This is especially important for natural gas furnaces. At what point do you have a gas furnace that’s too old for furnace repair in Los Angeles, CA to continue to be worth it? … because safety is priority number one. Natural gas furnaces aren’t “dangerous” heating systems—they wouldn’t be permitted into homes and be as widespread as they are if they were a constant major health hazard. But a gas furnace can become a safety concern if it is left unrepaired when it malfunctions, or if it becomes too old. One of the effects of aging on a gas furnace is the increase in the chance of corrosion developing on the heat exchanger. The heat exchanger permits the movement of heat from the combustion gas into the air without the two mingling. The byproducts of combustion are harmful to breathe, and a gas furnace is designed to safely vent them away without placing them in the air circulating through a house. A less urgent problem, but nonetheless a problem, is that an older furnace will cost more to operate. Even without continual use during the winter. A gas furnace accumulates dust and strain that will eventually make the system consume more power. Letting an old furnace stay in place year after year will make it too expensive to keep around. It’s difficult to pin an exact number on furnace age unless you have a technician inspect the furnace—or you notice signs that it’s aging past the point of safety and/or efficiency. Gas furnace in So. Cal can often last more than 15 years, but once beyond 15 years is the point to start considering a replacement. If you encounter CO detectors going off and a need to leave your house, we strongly recommend calling our team to look into the heat exchanger. Once a heat exchanger cracks, it usually means it’s time for a new furnace. We also advise calling us when a furnace is older than 15 years is costing too much to run. 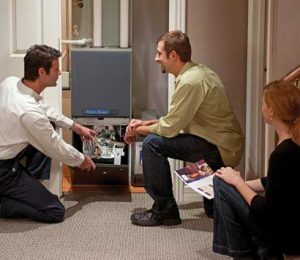 Talk to us today about your gas furnace’s future. Kilowatt Heating, Air Conditioning and Electrical has served Los Angeles, Van Nuys, and the San Fernando Valley since 1990. My Electrical Bills Seem Way Too High—What’s Up?